Many friends have suggested a visit to Langdon Hall for a great meal. It’s the place they go to celebrate an anniversary, propose, or even attend a wedding. Langdon Hall is that special location combining beautiful lush grounds, a historic stately mansion, and excellent dependable cuisine that isn’t easy to come by. The most comparable experience I’ve had is dinner at the French Laundry, which occupies a converted laundry house in Napa Valley. As I spoke to Executive Chef Jason Bangerter, passion simply exuded from him; his love for the property and desire to push Canadian cuisine to another level was apparent. As common with top restaurants, the menu features local ingredients when possible and relies on the inn’s own gardens for produce and garnishes. 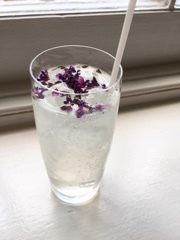 Even a drink like the Langdon Collins ($15) is finished off with real lavender flowers, adding a light floral essence and isn’t overpowering like syrup. There are many ways to dine at Langdon Hall, but if you have the time and resources, their tasting menu ($165) is a top choice. The experience combines so many ingredients and meticulously plated creations, really creating an encounter that exemplifies what makes the restaurant impressive. 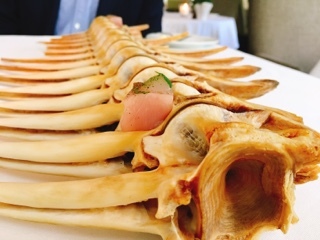 Take the first bite, a cube of west coast albacore tuna sitting on top of the fish’s bone (the actual specimen is actually an east coast tuna). The bite is sublime as the tuna melts onto the tongue leaving a light citrusy herb finish, it’s over before you even know it. Even if you’re not staying the night, arrive earlier to stroll through their gardens; they’re opened to the public (it leads to their spacious outdoor pool) and a visit before dinner service may allow you to pick the chefs' brains as they gather ingredients. 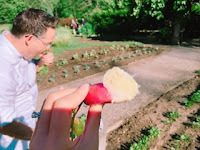 We were lucky to have Chef Bangerter himself show us around the property and sample a delicious crispy radish plucked from the ground and dipped in butter for a fabulous taste of the produce. It was followed by nibbles of various fauna bringing zips of flavours you wouldn’t think could come from a simple leaf – my favourite: the typical small clovers you see in the yard that exudes a citrusy kick. You’ll find a lot of these herbs scattered on the actual dishes. While dining at Langdon Hall be sure to eat everything, herbs aren’t simply placed onto dishes to make things look good, it adds an extra element to the dish as well. 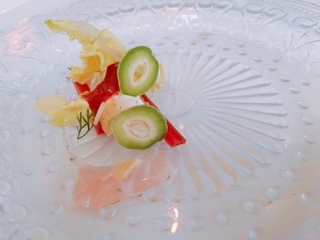 The second dish of their tasting menu was inspired by their greenhouses. As Chef Bangerter walked through them he was captured by the beauty of the potted plants and decided to add it to his menu. 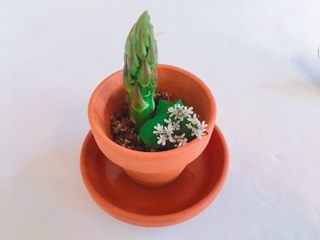 A young vegetable (we were served asparagus and fennel) is potted in “earth”, which isn’t soil but rather quinoa mixed with green goddess sauce that has a sour cream and onion essence. It’s a simple but tasty dish that I could see made into a fulfilling lunch if it came in a larger pot. 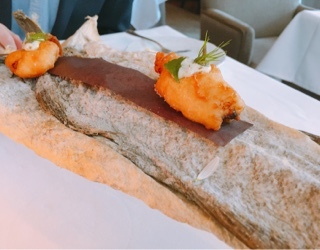 More fish is served on the summer menu, a cheeky cod on cod – in this case, a deep fried nugget on salted cod for presentation. The cod was nicely battered but my piece was a bit chewy (while my husband’s spot on), likely due to mine being thicker so hadn’t been cooked as thoroughly. On the side, a beautiful oxeye daisy caper remoulade with a hint of fennel that combines perfectly - it shows that any dish with the right herbs can really be elevated. 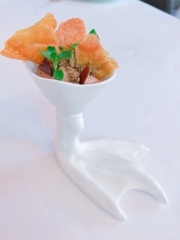 The duck foot, on the menu, refers to the vessel rather than the actual appendage. 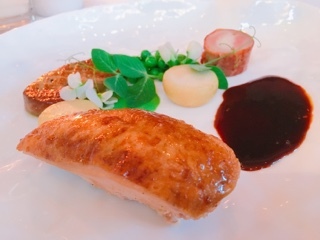 The whimsical dish was filled with hen liver mixed with chocolate to really augment the liver’s sweetness. Pieces of crispy skin added a nice contrast and were great for digging into the silky mixture. To make it really rich, shavings of white truffle lay on top, its earthiness pairing nicely with the creamy liver texture. While this was a luxurious dish, it was still balanced and the four-bite portion just enough to satisfy without becoming overwhelming. Who would think a dish simply named buttermilk would be so delicious? 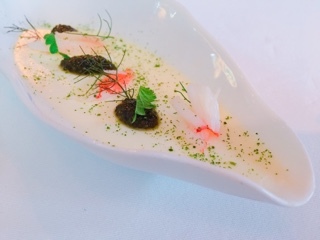 More aptly described as caviar and cream, I’d suggest eating the dish in the order it’s presented rather than picking and choosing ingredients. As you have each spoonful, a different flavour emits itself: sometimes lemongrass, other times the sweetness of snow crab, a briny touch from caviar, or a subtle fennel punch. Follow the journey for rich and refreshing contrasts; as the ingredients combine with herbs the flavours change again. 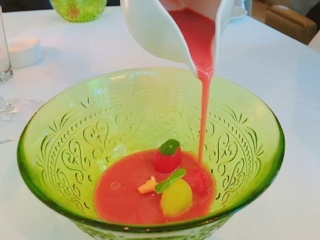 A refreshing strawberry gazpacho follows, the fruit’s sweetness combining with the tomato and basil base nicely. A bit of mascarpone is added to the broth for a hint of silkiness. A refreshing interlude. 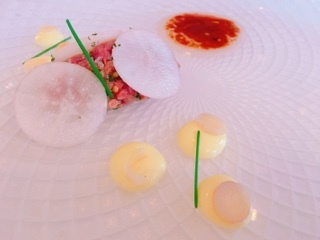 I was surprised to see lamb tartare arrive for the “marinated lamb”, thinking the whole time it’d be a seared version. My first time having the ingredient raw, it actually works rather nicely as it’s less chewy than beef. Dollops of aioli add a creaminess to the tartare, but it’s the pool of lamb fat vinaigrette that provides a completely different rich tart kick to everything. If only there were a couple more slices of black radish, its crispiness went so nicely with the smooth tartare. As the next course is presented, we’re advised the goat cheese is made by a local purveyor Langdon Hall has featured for many years. Turns out, this supplier is Monforte, a small artisanal cheese company often only found in farmer’s markets (I’ve purchased things at Mel Lastman’s Square and Evergreen Brickworks) or restaurants. Their subtle goat cheese adds a creamy touch to the rhubarb. The green sliced ingredients are actually immature almonds, which have that deep almond flavour but with a chewiness in lieu of crunch. For those who have read Gastro World for a while, you know I rarely order roasted chicken at a restaurant. But, wow does Langdon Hall’s poussin impress. The breast is first cooked on the bone and is then removed when serving with a lovely honey and lavender glaze on the skin. The de-boned dark meat is wrapped in a thin prosciutto, making that one medallion so tender and flavourful. A generous slice of seared foie gras accompanies and is thinly sliced allowing the crispy coating to be tasted throughout. 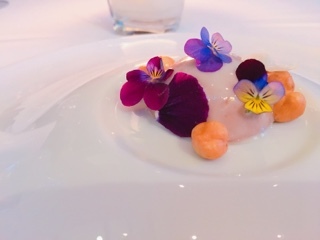 Finishing off the plate are just cooked through sweet turnips and peas with their shoots and flowers… great for cutting the fatness of the foie gras. 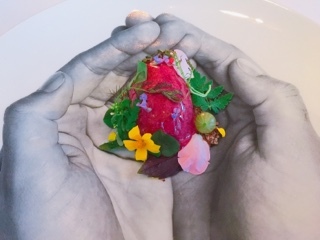 The first slightly sweet dish featured a “taste of the garden” with a blackberry strawberry sorbet adorned with various foraged leaves and edible flowers. 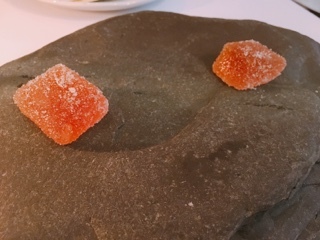 A salty crumble sits at the bottom mixing with the sweet sorbet, the garnishes are both citrusy and bitter. All together, the dish has a Thai flare with its combination of flavours. 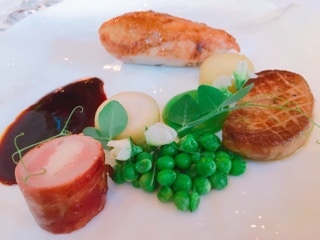 The plating is stunning with a pair of hands screened onto the front and back of the dish, reminding diners of the caring hands require to create the lovely dishes. 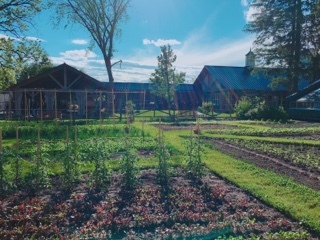 Indeed, Langdon Hall employs a fleet of gardeners who work with Chef Bangerter to cultivate the ingredients – including tropical specimens you wouldn’t think could survive in the Ontario climate. The Chef’s next challenge for them: possibly having his own cocoa trees on site. As the Ontario bee population rebounds, their sweet nectar is making its way back to desserts. 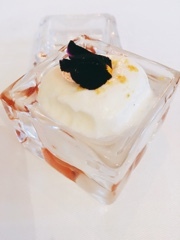 Langdon Hall’s honey box (that’s what she said), features a salty cube of honey comb with a light and fluffy honey foam on top. A sprinkling of honey pollen completes the dessert adding a slight floral essence. To end, a gorgeous milk chocolate hazelnut bomb. As it’s first presented, the half sphere looks like it could be a fruity dessert; get through all the flowers and into the dome and you’ll find a chocolate mousse surprise, which goes great with the crunchy hazelnuts. All the chocolate used in the tasting menu is harvested from a Dominican Republic plantation that Langdon Hall works with. In fact, Chef Bangerter informed us he just returned from a trip there to participate in harvesting and roasting the cocoa. While he was there, he even whipped up a dinner for everyone with local ingredients he could find on site: the main a delicious sounding fish wrapped in banana leaves that one can only hope will make its way onto the Ontario menu. 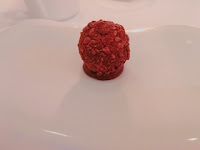 Aside from the citrusy kalamansi jelly, the last bite of the tasting menu featured the cocoa in all its glory: a chocolate truffle with powder and nibs on top. As the rich flavours flood the mouth, you’re not greeted by the typical sweet melting pool of ganache, rather the truffle is chewy and soft so it can be held longingly on the tongue and you taste chocolate without sweetness… a rich but not heavy ending. During such a long meal (it lasts about three hours), a trip to their toilet is inevitable. Although it’s a bit of a journey, make sure to go downstairs to see all the old photos of the property and the Wilks family (the original owners of Langdon Hall). Of course, their home wasn’t quite as stately as the current format (a new separated event area and spa has just been constructed); nonetheless, you see pictures of the beautiful gardens that are still a prominent feature of the current location. For being in such a quaint countryside and the inn having a relaxed cottage feel, it would be nice if they got rid of the antiquated no denim and sports jacket dress code. Of course, I understand they don’t want diners visiting in cut-off shorts, but there’s a friendlier way to create a nice dining environment that’s also welcoming. For example, at Eleven Madison Park, they stress that there’s no dress code but warn diners that people tend to dress up for the occasion. Gentlemen dine in denim, but it’s still smartly paired with a collared shirt and/or jacket. I was hardly offended to see jeans. Aside from the dress code, I can see why Langdon Hall garners all the praise including its long standing position in Canada’s Best Restaurants list (they’re #15 in 2017). The combination of meticulously prepared dishes and haunting beautiful surroundings is hard to replicate. The inn is only an hour away from Toronto; in a short drive you’ll be able to indulge and just get away from it all.